Hak is normally well know from canned veggies but this is a new kind of mix with fruit and veggies into a healthy drink. The first time I looked at the mix of orange, mango and carrots I was not sure if the taste would be that good. However when I drank it, it was do able because actually you don't taste the carrot at all. The taste and flavors are all hidden by the taste of the orange and mango mix. However the marketing and commercials for this were pretty short shown on the television or othe places, and nobody actually buy these because nobody know this. The big problem I see with the product is that they use the HAK logo too big on the packaging, because HAK is too well known as canned vegetables and not for beverages. 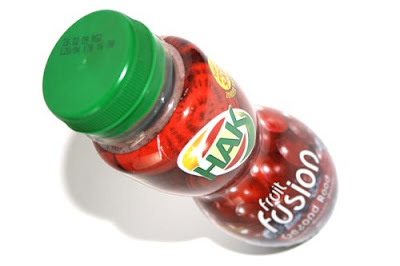 For me it would had been better if they used a small Hak logo and make a special logo for the Fruit Fusion that will be shown big on te package. 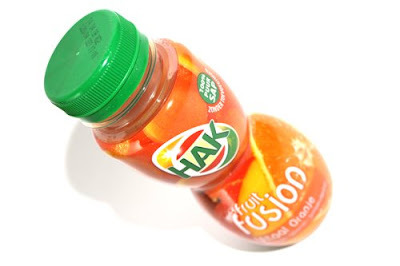 Alto the word fruit fusion is bit too much blended away and not strong enough compared to the Hak logo. Another flavor I drank was the Red version with grapes, berries and beets. And is it pretty much the same story you don't taste the vegetable part and just drink it away easily. Just try it out you never know if it is good or not if you don't try it at all. Pretty much get the well needed amount of fruits and veggies, but mostly still recommend not to use these drink as a replacement for them. The design part is pretty enough with the chosen background photo. However just the font used for fruit fusion and the placement of the text are not the well. And pretty much the HAK logo is a big problem with this design. Also the empty bottle cap is boring. Would had been better if they place the HAK logo there and replaced the HAK logo on the shrink wrap with a proper logo of the fruit fusion.